WIN TIX TO IRVING MUSIC FACTORY in IRVING, TX on 10/1! 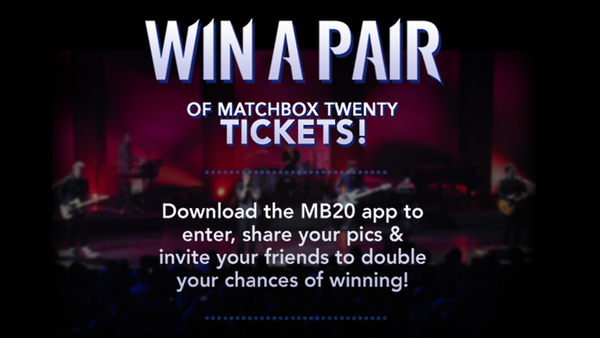 DOWNLOAD MATCHBOX TWENTY APP on iTunes or ANDROID! 2. Tap Camera and Post your favorite MB20 Photos, Pics, Memories, Events! 3. Two Winners, Four Tickets Per Week! The person with the most posts, photos, hearts and comments wins! 5. After you download Matchbox Twenty please "Review" on the Apple App Store for more points! Only post the same photo one time. No purchase necessary. Tickets courtesy of Matchbox Twenty. Must be 18 years or older. The Promotion period begins, Monday April 3rd, 2017 with winners announced every Tuesday and Friday at 5pm PT until September 27th, 2017 (“Promotion Period”). This promotion is in no way sponsored, endorsed or administered by, or associated with Facebook, Twitter, Instagram or any other social network or platform. You understand that you are providing your information to Promotion Entities, and not to, Facebook, Twitter, Instagram or other social network or platform. You may be charged data rates if accessing the registration page from your handset according to the terms in your Wireless Calling Plan. Wireless service is not available in all areas. The Matchbox Twenty App created by BounceChat is designed to help Non-Profits, Events, Brands, Artists, Bands & DJ's to connect with their Brands with Fans at Concerts, Shows and Events. BounceChat's Geo-Fence Technology allows people to share and communicate exclusively with others nearby within 100 yards at a show, 1 mile within a festival or around the world! Learn more here. www.bouncechat.com *Previous winners ineligible. 1 pair of tickets per person.